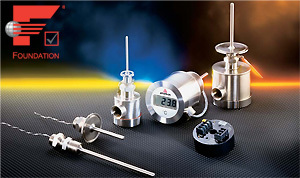 Anderson Instrument's electronic temperature sensors combine industry proven, all stainless steel construction with modular components. Interchangeable RTD elements, wiring heads, transmitter modules and digital displays can be individually selected. Components can be factory or field assembled in the optimum configuration for any application. To further facilitate adaptability, Anderson's RTDs are offered with the widest selection of sanitary clamp, thermowell and flush-mount fittings available. Temperature transmitters are available in analog, HART "SMART" and Foundation Fieldbus versions. These modules can be factory or field installed in any wiring head or panel mounted remotely from the RTD element allowing for greater flexibility.